Everywhere you look, industry insiders, analysts and those involved with the mobile world are touting mobile web as the next big thing. It’s being heralded as the ruling form factor for browsing the internet, and it’s growth is claimed to be unrivaled. While a lot of this is true, and there are stats to back this all up, there are many reasons why you shouldn’t overlook the desktop. Mobile may play a very vital role in the online success of your business, but the desktop is far from dead. In fact, we believe that the standard web should be catered for just as much as mobile web, and in this article we’ll explain a few reasons why. While the big dream is to have everybody the happy owner of a smartphone, it’s still not something we’ve achieved yet. Yes, there are many people that now own smartphones, but there is still a large portion of internet-connected individuals that do not have a smartphone. It’s also important to account for the smartphone owners that do not use mobile web on their devices – combine these people with those that do not own a smartphone, and the numbers start to rack up. Just like you would miss out on mobile users if you didn’t provide a mobile website for your business, you’d also be missing out on desktop-only users if you decided to focus solely on the mobile web. Even though many smartphone owners access the internet from their mobile devices, it doesn’t mean they do not use other internet-connected devices either. The wide range of internet-connected devices gives many people many different portals to access the internet from. In most cases, there may be a main device an individual may use, and their other internet-connected devices, such as smartphones, are used for quick searches or other tasks while away from their main device. In a lot of cases, smartphone owners will spend a lot of time browsing the internet from their laptop or PC while at home. So although the hype of the mobile web is very real, the desktop is not going anyway – people are going to use laptops and PCs for years to come. It may sound like a lot of effort trying to split your efforts between the desktop and mobile web. In some cases, it can be, and it could be doubly expensive maintaining both versions of your website. Fortunately there is a solution. Responsive websites are a great option for people who’d like their websites viewed on multiple form factors. 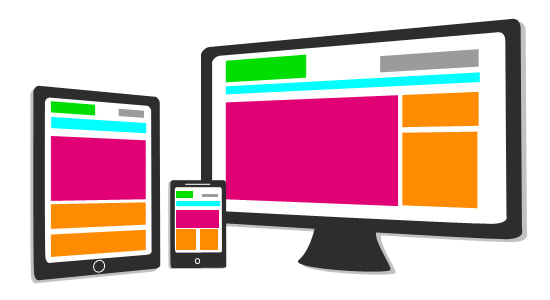 A responsive web page will adjust to whatever device it is being used on automatically. For instance, it will appear as mobile-friendly as possible when viewed on a smartphone, but it will change it’s appearance when loaded on a desktop browser. Responsive websites are the simple option because they offer one streamlined experience that users can access from anywhere. More importantly, responsive websites are packed into one single domain, so you’ll be able to save on development and hosting costs. For more information on responsive web sites and what they can do for you, contact us today.